For those who aren’t in the know, Excruciating Terror was a hateful grindcore band from L.A. The band gigged and recorded the albums Expression of Pain and Divided We Fall in the 1990s, along with some splits and EPs before breaking up. To this day the band is still beloved by listeners and many playing in the genre. A few members of the band are getting together with Dorian Rainwater (whom you can read about in our interview) and playing a show on September 14 at 2 pm at The Vex, for an event billed as a tribute to Jesse Pintado of Napalm Death and Terrorizer fame. 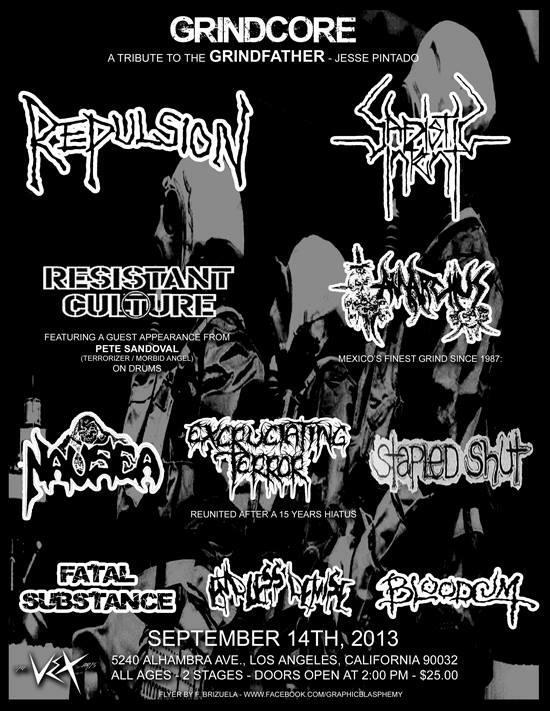 Also on the bill are such notables as Repulsion, Sadistic Intent and Nausea (whom you can also read about in our interview), among others. The flyer, posted by I Heart Powerviolence on Facebook, is below. This gig is big news for fans of grind. D.U. interviewed Excruciating Terror back in 1997, and you can find the conversation in issue #19 of the archives. This entry was posted in News and tagged Excruciating Terror, grindcore, Napalm Death, Nausea, Repulsion, Terrorizer by Editor. Bookmark the permalink.